Just like reviving Westerns, it is never certain when audiences will get behind a Gangster movie set in its heyday, and can be a risky project to take on, since it has to be big enough to impress (which could mean a sizable box office bust - this film's budget was $65 million and only made $19 million on its opening weekend). 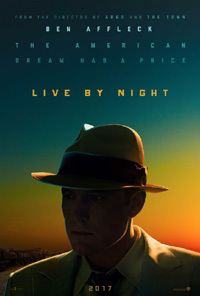 Ben Affleck took the chance, not only writing and directed this novel adaptation, but also producing and starring in it. 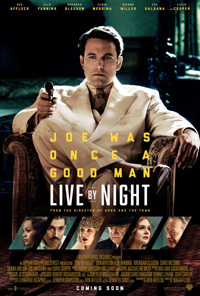 Arguably an accomplished all-rounder with several Oscars under his belt, Affleck rarely plays the bad guy. And when he does, it's usually the "likable villain", as in this case. Disillusioned by the horrors he experienced during the first World War, Joe Coughlin returns home to Boston vowing never to follow orders again, becoming an outlaw robbing banks and other locations you'll find cash (including other crime operations). But his carefree independent wading through the underworld waters during the mid-1920s prohibition era get stormy. This is directly related to the fact that he's having an affair with Emma, who happens to be the girl of Albert White, head of the Irish mob! Coming near death and losing the woman he loves as a result, Joe goes against his principles and approaches the Italian mafia (who are looking for someone to take down White). They send him to Florida to muscle out White's rum operation. Things go well, the money rolling in, and Joe's mourning of his girl is healed when he falls for his Cuban associate's sister. In stead of introducing heroin into the market as the boss wants, Joe looks at opening a casino in stead. The smooth ride however gets bumpy when hurdles get thrown in the way, from the KKK making things difficult, to the police chief's daughter preaching against gambling, and of course the ever looming danger of being knocked off by the competition. With spurts of action and romance, it doesn't feel as if the balance between these two were struck as successfully as it could've been - As a full on violent gangster movie it would've had more pace, but less human substance, and if it relied too much on the romantic side, the crime element would be a subtext backdrop. The political, racial and cultural melting pot inclusions all make for a varied narrative elevating it beyond a one dimensional movie, however it won't stand beside other gangster classics like the Godfather, Bonnie & Clyde, even The Cotton Club. While his Good Will Hunting screenplay Oscar with Matt Damon is well deserved, I'm still not so sure whether his Argo was the best at that year's awards… Though entertaining enough, in the case of Live By Night, I wouldn't expect his statuettes to be earning new shelf neighbours. Batman duties are calling, Ben! PS. Before the main feature started, it looked as though the preceding producer and distributor logos received an old film dust & scratch damage treatment (not sure why), but it got me thinking: the movie could've evoked an entirely different perception and mood had it been desaturated to black and white with an old film look (but in this digital era it may not connect with a younger audience, only possible with art movie projects like for instance The Artist).